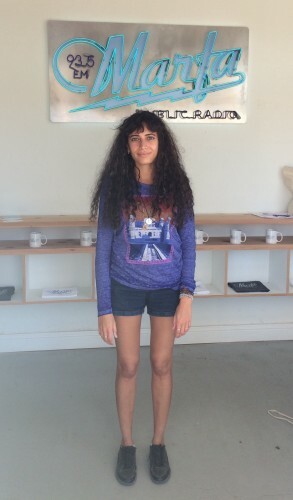 Hala Alyan, at Marfa Public Radio, March 18. 2016. Hala Alyan is our guest on West Texas Talk. She is a Palestinian American poet and clinical psychologist who is a Lannan Foundation writer-in-residence in Marfa. Her work has appeared in journals such as The Missouri Review, Prairie Schooner, and Colorado Review. She lives in New York City and talks and about her itinerant childhood, growing up in various places; her visits to Beirut and other cities in the Middle East; and her discovery of poetry. This entry was posted in and tagged Lannan Foundation, Poetry. Bookmark the permalink.